Last month, I had the privilege of giving a talk at Towson University to the Senior Instrumental Music Education Seminar. 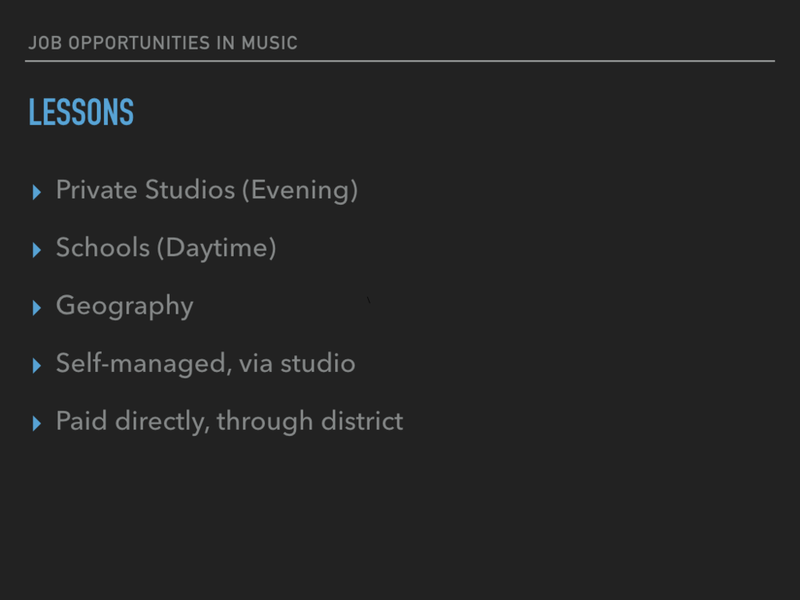 Friend and colleague Dr. Christopher Cicconi, TU’s Director of Bands and Orchestras, was kind enough to invite me to discuss the wide range of musical opportunities and challenges to the musician entering the workforce in, in this case, 2019. 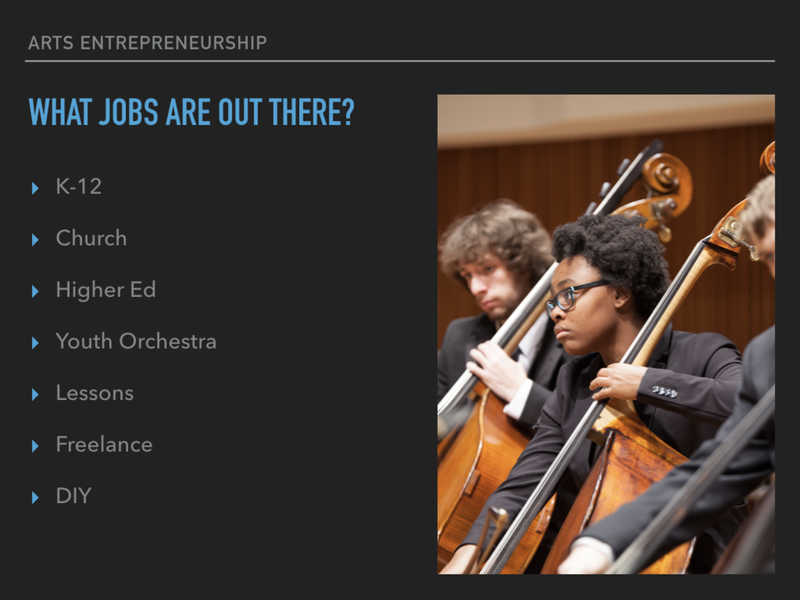 First we answered a critical question: what is an Entrepreneur? In short, an entrepreneur is a type of inventor who invents ways to make money. 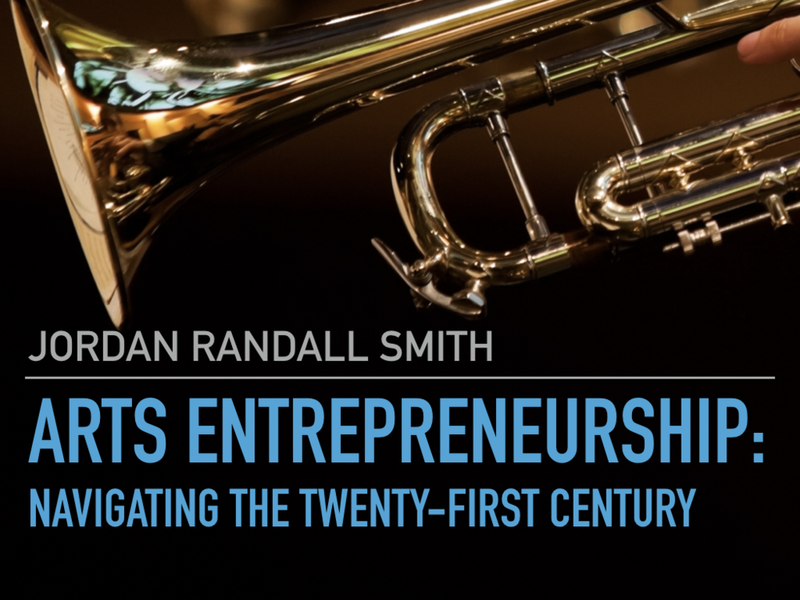 Arts entrepreneurs apply this spirit of invention, unsurprisingly, to the arts. I particularly enjoyed sharing some experiences to do with my experiences as a church Music Director. 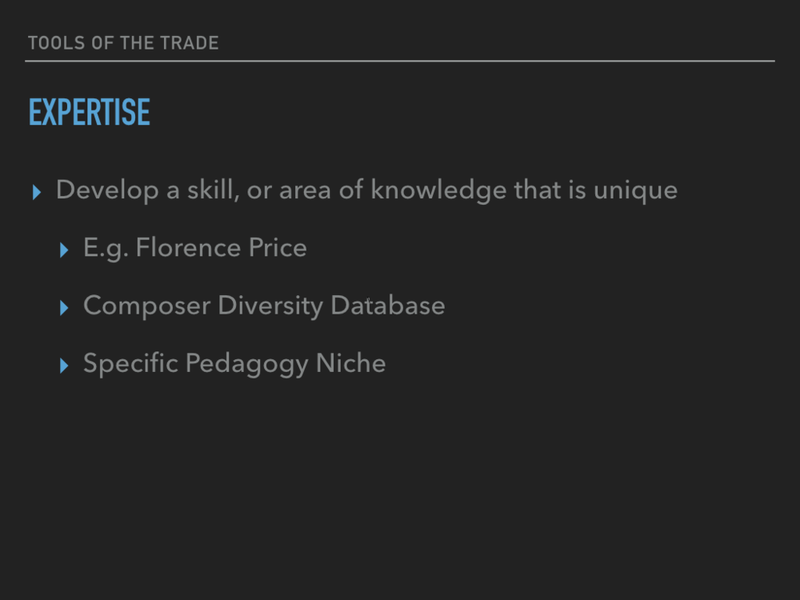 My position is that instrumental music teachers benefit immensely from coming to better understand choral music repertoire and the mechanics of the voice. Critically, we discussed the importance of authenticity. If you go into the career merely looking for the easiest path to rising through the ranks, it will be difficult to attract interest to your work. But, if you find opportunities that you personally find rewarding while you serve a higher purpose in the industry and in your local community, people will eventually take notice. It is important to stay grounded in this business and building meaningful projects is a great way to do that. Below is the slide deck I used. To download a PDF or embed the talk, click the buttons below. If you would like access to the original slide deck or the complete talk, please feel free to contact me. An inventor who invents ways to make money. Arts Entrepreneurs apply this to their craft. 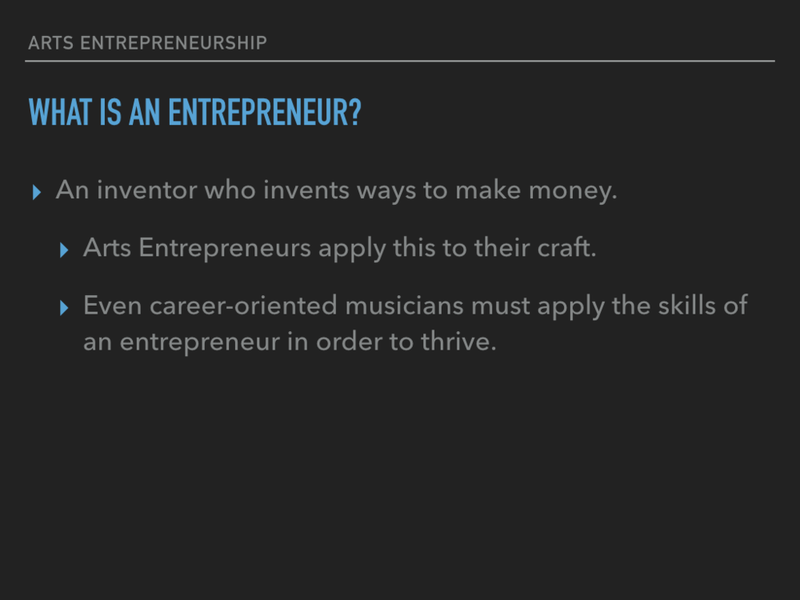 Even career-oriented musicians must apply the skills of an entrepreneur in order to thrive. DIY: If The World needs it, YOU Need to Build it. 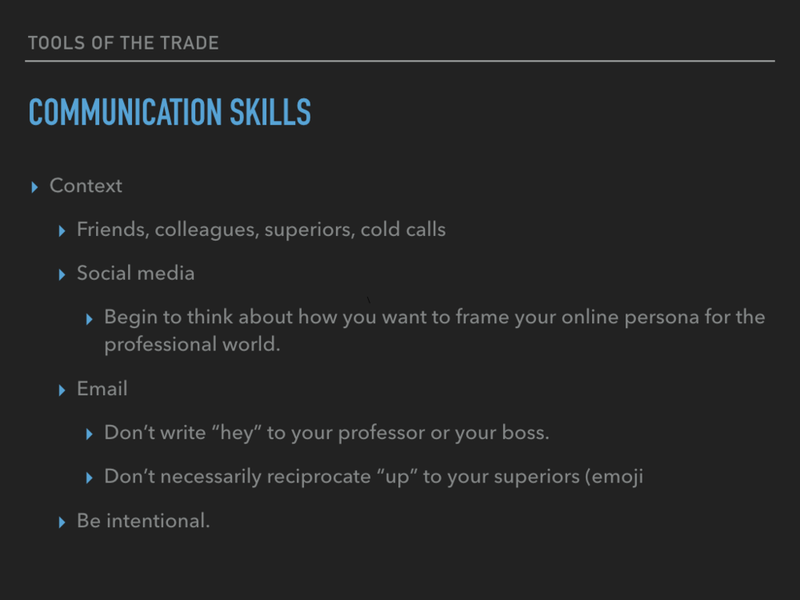 Context Friends, colleagues, superiors, cold calls Social media Begin to think about how you want to frame your online persona for the professional world. Email Don’t write “hey” to your professor or your boss. Don’t necessarily reciprocate “up” to your superiors (emoji Be intentional. Don’t dress for the job you have, dress for the job you want. Always dress one level above the minimum expectation. Never be the most poorly-dressed person in the room. Assume that you will need to ask! 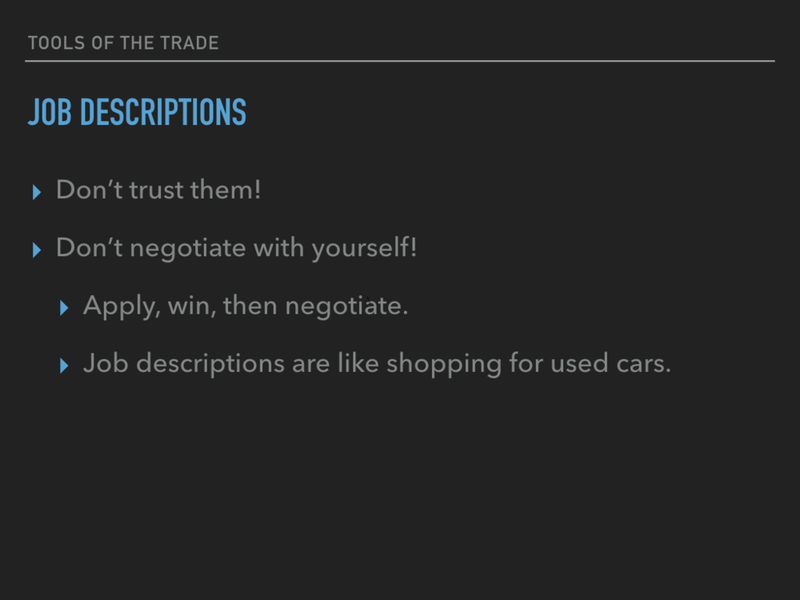 Job descriptions are like shopping for used cars. Show your enthusiasm for our profession. Do a great job, then show grace when your colleagues need it. Don’t get sucked into gossip in your school / workplace. Boring speaks to craft. It speaks to craftsmanship. It speaks to long, laborious, often repetitive tasks that have great payoff, if only the craftsman will apply the time and diligence to see the project through to the end.